The Channel Islands comprise the Bailiwick of Guernsey (Guernsey itself [approx 25 square miles] and the much smaller islands of Alderney, Sark, Herm and Jethou) and Jersey (approx 40 square miles). 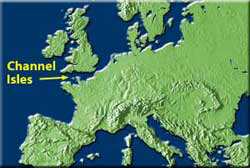 They lie 25 miles west of the French coast and 70 miles south of the nearest point on the English coast. The island of Guernsey has a population of approximately 65,000. Both Jersey and the Bailiwick of Guernsey are self-governing Crown dependencies. Their unusual relationship to the English Crown can be traced to 1066, when they were on the winning side at the Battle of Hastings, as territory of the Duke of Normandy - later known as William the Conqueror. Want to know more about Guernsey? Visit the CIA! The Guernsey flag - the cross of William the Conqueror superimposed on the cross of St George.